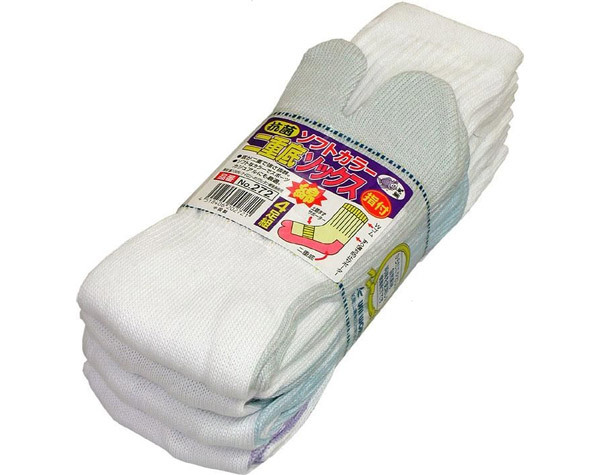 These tabi socks feature a double, reinforced toe, sole and heel for extra comfort and durability. The double toe/sole is also colored, giving these socks a nice distinctive look. Ideal for any situation and essential for wearing with Japanese jikatabi or sandals. These tabi socks feature a double, reinforced toe, sole and heel for extra comfort and durability. The double toe/sole is also colored, giving these socks a nice distinctive look. Ideal for any situation and essential for wearing with Japanese jikatabi or sandals. Cotton, with extra support for the arches and calves. They come in four colors and are mid-calf height.